As the Wiggle Honda Pro Cycling women's team - featuring Olympic track champions Laura Trott, Dani King and Joanna Rowsell - prepares to launch, the question of equality in cycling is once again thrust into the limelight. The 23-year-old from Otley in Yorkshire, who was talent spotted by British Cycling at the age of 15, first raised the issue on the back of her greatest triumph to date, winning Olympic road race silver - Team GB's first medal of the London Games. Moments after her medal presentation she told the media: "The sexism I have encountered in my career can get quite overwhelming and very frustrating." Armitstead points to disparity in pay and prize money for women compared to men and the lack of media coverage for women's cycling. With the emergence of the Wiggle Honda Team, backed by the Bradley Wiggins Foundation, and another women's team funded by the national cycling charity CTC, Armitstead faces the inevitable barrage of questions about whether this tackles the problem. Her response may be surprising to some. "For me it's almost become more frustrating," she says. "The general media in Britain don't understand the ins and outs of cycling, so they fall into the trap of believing that something is going to create real change, when for me I know it's just a media spin off. "But, at the same time, if I become too involved in it and let it bother me too much then you become the person who's the negative person all the time - and I don't want to be that. "I'm a passionate and honest person, but I am positive," she adds. Recently signed to a new women's team in Holland, Boels-Dolmans, where she will ride with fellow British Olympian Lucy Martin, Armitstead is hoping for a strong season ahead. But she says the issue of inequality is still affecting the sport as a whole. Asked if she can earn enough money as a professional cyclist, she answers: "I can, but not all the girls in my team can and that's the real point. "I'm happy that I make a living from cycling, so for me it's more about the girls at the bottom end who are giving up their races to try and help me win, the domestiques, who aren't getting paid a good-enough wage." And she is baffled as to why the sport does not receive more media attention, particularly when the crowds at the Olympics showed there is an appetite for it. "It's simple steps, things that aren't even hard," Armitstead says. "We have a few classic races in the spring that run alongside the men's races. The cameras are already there, the presenters are already there, your audience is already there watching the television programme, but it's not broadcast. "Why not, at the start or at the end, show 10 minutes of the women's race? It's not a big problem to do that I don't think." Domestically, top British male outfit Team Sky do not run a female professional side. Armitstead says to run a top-flight women's team would cost around 450, 000 euros a year - an amount she describes as "nothing". "I've been told before that if they wanted a women's Team Sky they would only have to tighten up on logistics and flights," she adds. "But I'm not fighting for a women's Team Sky. "I'm very happy where I am and I get great opportunities, so if there was a women's Team Sky the last thing I want people to say is 'oh well, you've been asking for a women's Team Sky and you're not going there', because that's probably what would happen - I probably wouldn't go." British Cycling boss Dave Brailsford said he is looking to address the "gender imbalance" in road racing whilst the management committee of the International Cycling Union (UCI) unanimously approved a plan intended to promote women's cycling in September. The financial support of Olympic time trial champion and Tour de France winner Wiggins has provided an outlet for some British female talent whilst the Wiggle Honda Team says it will offer "real wages" for women cyclists. Owner and rider Rochelle Gilmore explained that "women have traditionally ridden for contracts as little as one-tenth of what the men earn". Whether the new team tackles the problem or not, it provides competition for Armitstead, with her former track team-mates turning their attentions to the road. "The stronger the domestic competition, the better," Armitstead says. Asked if she thinks King, Trott and Rowsell can adapt to the road she answers: "I don't see why not. "They've all got the physical ability to do so. It's just whether they want to I suppose. "I think this season they are going to use the road to gain strength rather than gain results, so it's how much they want it I guess." Armitstead, though, will not worry about what those around her can do. Self-coached and highly-motivated, Armitstead has her own goals. Vos is a two-time Olympic champion - once on the track, once on the road - a two-time world champion on the track, a two-time world champion on the road, a two-time winner of the Giro d'Italia Femminile and a five-time world champion in cyclo-cross. 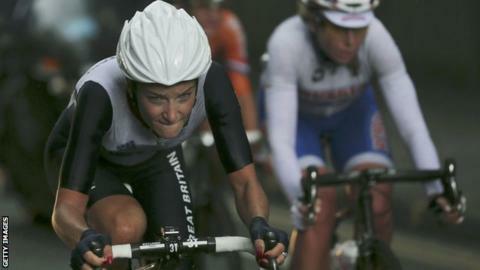 But Armitstead points out that she was close to beating her in London and is not phased at the prospect of facing her. "Marianne is this kind of legend in women's cycling and maybe the rest of the women need to get over that a little bit and push her out a bit," Armitstead says. "There's kind of this aura around Marianne that she's unbeatable and I don't believe that." Feature: Is Vos the greatest? Driven on by her Olympic silver medal, which she says showed her she was better than she thought she was, she is looking forward to a future in her new team. She says: "It's the first time I've ever ridden for a team where - if I'm happy and everything goes well - the sponsors have signed up until 2016 so there's a real future there if I want it. "To be around people who are so enthusiastic about women's cycling is really good - it rubs off on us all." Armitstead talks through her plans for the year, saying the one-day Tour of Flanders, part of the Women's Road World Cup, is her "big goal". She is also targeting the UK National Championships in June, which will take place on the Commonwealth Games course in Glasgow, followed by the World Championships in Florence in September. On the cobbled hills of Flanders, Armitstead will come up against Marianne Vos, who beat her to gold at the Olympics, in what is developing into one of sport's most intriguing rivalries. "I'm happy to fuel that fire because it keeps people interested," says Armitstead. "It (the Tour of Flanders) is the only World Cup that Marianne has never won, so if I could get there before her that would be pretty sweet - but it's going to be tough. "I expect Marianne to be the person to beat for the rest of my career. "She's just a phenomenal rider. It's horrible." And that, after all, is what sport boils down to irrespective of gender - the desire to win.